The Star Mountain Plaza (SMP) development has seen completed stage one. 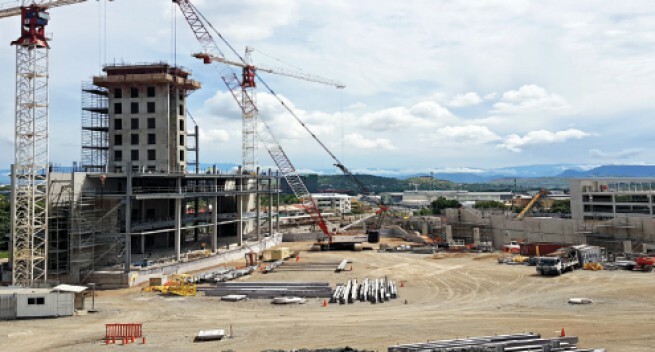 This is for the detailed engineering design and commencement of the above ground structure of the Hilton Hotel building and the Kutubu Convention Centre for the Star Mountain Plaza in Port Moresby. Star Mountain Plaza project manager Eric Alome when giving an update in the MRDC’s December issue of Tokaut revealed that there have been mixed results in 2016 in terms of overall performance on the hotel. However, Mr Alome stated that there were also some key successes including the securing of the BSP K200m bank finance, completion of the car park structure, completion of the detailed engineering design for Stage 1, and commencement of the "above ground" structure of the Hilton Hotel building, combined facilities, and the Kutubu Convention Centre. He also pointed out some issues and difficulties outside of the project environment and beyond their control, such as the weakening of the PNG kina against major foreign currencies which resulted in significant foreign exchange losses on payments and procurement in foreign currencies. "Others that were within our control could have been better managed, however, have now become lessons learnt for everyone involved in the project going forward. 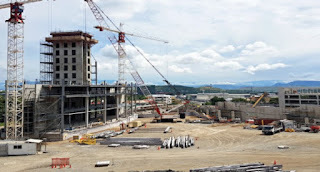 "As investor and developer of one of the single largest commercial property investments by a Papua New Guinean company in extremely tough economic conditions both locally and internationally, we are taking our successes and victories in stride, learn from our mistakes, and continue to improve everyday to ensure a successful completion. "By virtue of its size and scale, the SMP demands the highest level of commitment and attention as anticipated by investors, stakeholders and most importantly, the people of Papua New Guinea. To this end, we are committed and focused on delivering the SMP by July 2018 after an extension of six months," he said.